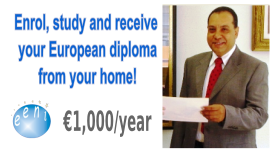 Syllabus of the Online Course (Subject): International Trade Finance. Country risk. Credits of the Online Course / Subject “International Trade Finance”: 4 ECTS. Both can be performed in the currency of the exporter (for example, Euros) or any other fully convertible currency agreed by both parties. In the second case, the company assumes certain risks as the exchange rates difference. However, it can also profit from trading in another currency if there is a rise in foreign currency value. Financial transactions in foreign trade can be performed in the currency of the exporter/importer or a third currency. In many cases, export companies must facilitate financing for their clients mainly due to the market requirements. In Foreign Exchange Market, dealers trade in currencies. Product and service exports, foreign direct investment, and foreign loans forms the currency supply whereas currency demand consists of imports, foreign direct investment and other factors. These operations stimulate the buying and selling of currencies in a market governed by supply and demand. If a payment for a service provided or for a product delivered to a foreign client is in a currency other than in which the exporter usually operates, the exporter is exposed to the risk of exchange rate fluctuation. Any specific requirements attaching to the shipment. Country risk is caused by political (unwillingness to repay) or economic (inability to repay) events in a particular country. Normally, the country risk is measured as transfer risk or cross-border risk, which is another terminology used to describe country risk. The central element of transfer risk is the possibility that the borrower may not be able to secure foreign exchange to service its external debt due to economic or political risks of a country, despite the accessibility of local currency. 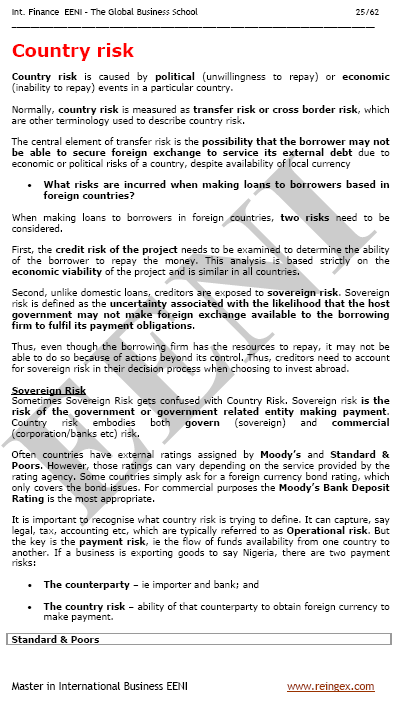 The Sovereign risk is the risk of the Government or Government-related entity making payment. The Country risk embodies both govern and commercial risk. The Corruption perceptions index measures the perceived level of public-sector corruption in 180 countries economies.